Tri tip is a roast that is referred to by several names. Most chefs refer to it as a tri tip roast or steak. It has often also been referred to as a Santa Maria roast, from the area in California where it was first widely used. The mix of flavors in the basting liquid is amazing – rosemary, orange and lemon juices, mustard and hot pepper. In a bowl, combine the first 9 ingredients. Cover and refrigerate until ready to use. With a sharp paring knife, make several small slits in the roast and insert the garlic slivers. Lightly coat the roast with olive oil. In a bowl, combine the salt, pepper, rosemary and oregano. Sprinkle over the roast. Prepare a medium hot fire with a kiss of smoke in your grill. When you see the first wisp of smoke from the wood, place the roast on the grill. Close the lid and grill for 40-45 minutes, turning and basting with the refrigerated mixture every 5 minutes, until a meat thermometer inserted in the thickest part of the roast registers 130°F for medium-rare, or until desired doneness. Let rest for 15 minutes before carving across the grain into thin slices. What is A “Kiss” of Smoke? For charcoal grills, toss a handfull of water-soaked wood chips onto a hot charcoal fire. For gas grills, place dry wood chips in a foil packet poked with holes or in a metal smoker box and set over the flames, toward the back of the grill. When the chips begin to smoke, it’s time to grill. 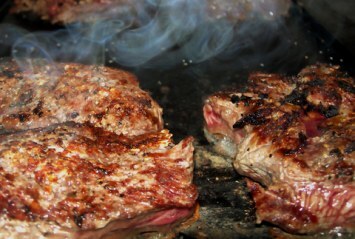 The grilling time will be short, so just a kiss of smoke will penetrate the food. To cook this way, you must close the grill lid. This is a wonderful recipe for those who need to eat gluten free or for diabetics. Diabetes recipes should be fairly low carb and this one certainly is. Serve it with a large salad and grilled vegetables. This tri tip recipe comes from the wonderful cookbook 300 Big and Bold Barbecue and Grilling Recipes. Santa Maria tri tip is just one of our delicious smoker recipes from this amazing cookbook. Look here for the pulled pork recipe. This is a great recipe for those who love using smoke on the grill, or who want to give it a try.